Why is Gartner spewing such irresponsible and unsubstantiated data about "robobosses"? Clients are being subjected to such a load of nonsense about the impending impact of robotics and cognitive computing on enterprise jobs, many are literally terrified. Conversing with the "head of automation" for a F500 organization today, is akin to meeting a Secret Service agent in a clandestine alleyway. These people do actually exist, but most have to conduct their work under a veil of secrecy, due to the level of discomfort and panic our robo-commentators are making in the presses. Remember the panic about jobs getting shipped offshore? Well, that is child's play compared to the emerging tumult of fear being generated by jobs being completely eliminated by robotics. Net-net, people are frozen stiff with fear, and it's the responsibility of respected analysts, consultants, academics and journalists alike to educate and world using real, substantiated facts. Sadly, the likes of Gartner, McKinsey, Oxford University and our beloved Stephen Hawking, all seem hell-bent on capitalizing on the panic to grab the headlines (read my post earlier this year) as opposed to dispelling much of the ridiculous scaremongering about the impact of automation on job losses. At HfS, we published a very thorough analysis on the impact of automation on global services jobs, showing there is likely to be modest downsizing of ~9% over the next five years as low-end tasks are increasingly automated across major service delivery locations. And this 9% will be immersed in natural attrition and redeployment of workers to other industries, as global services streamlines and matures as an industry. Yes, there will be impact, and it will be somewhat painful to absorb for some enterprises, but it's not the impending workforce apocalypse these people are predicting. So why, pray tell, is Gartner, a respected voice in IT research, continually pounding us with continual scaremongering that we're all doomed to the will of the robot, and we may as well start preparing for a life of unemployment, or sandwich making? Oh wait, robots can even make sandwiches, right? Peter Sondergaard, Gartner's Head of Research, predicted one in three jobs will be converted to software, robots and smart machines by 2025. OK, that's so far out in the future, I think Peter's on pretty safe ground here - he's probably going to have cashed in his Gartner stocks long before then, in any case, and be on a golf cart somewhere, when one very earnest soul decides to dig into the Gartner archives of previous decades to read very old research, with very dodgy predictions, that absolutely noone care about anymore. So we'll let Peter off the hook here - he wanted to make a splash at his Symposium and he achieved exactly that. So why do we, at HfS, view claims like this as factually incorrect and irresponsible? There is only one very shaky example of "robo advisors" in the industry. The most cynical implementations of automation that HfS has come across, thus far, where direct replacement of human labor by robots is the declared outcome, are examples such as Royal Bank of Scotland, where virtual agents, deployed as “robo advisors” are solely deployed to replace FTEs. We've also witnessed a service provider radically downsizing some delivery staff claiming success of its robotics strategy (only to find out later these staff were simply redeployed elsewhere). Let's be honest here, the onus so far seems to be about firing people and using "robotics" as the smokescreen. While Intelligent Automation decision-making will undoubtedly increase (view our Continuum here), we see no examples of employees being supervised by bots. 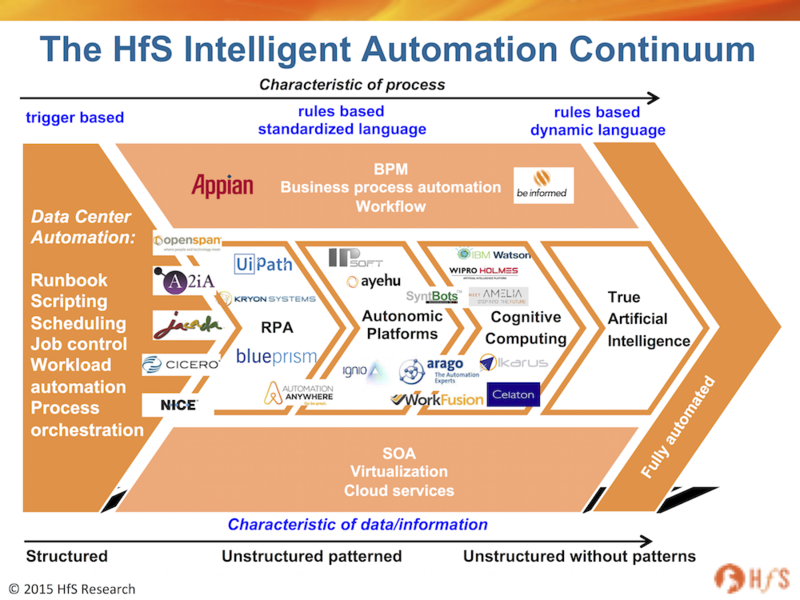 At HfS, we are covering every deployment in the industry, and are just not seeing it. We still haven't had a real debate on the ethics of automation and cognitive computing in the B2B environment. Suggestions that employees will be supervised by bots can be traced to the broader discourse on Artificial Intelligence, where more consumer-facing technologies are discussed with undercurrents of movies, such as the Matrix. These discussions tend to focus on technology capabilities of providers like Google and Facebook. However, we haven’t seen a similar debate in the B2B space. If anything, the B2B urgently needs a debate on the ethics of automation, in light of these nascent cognitive capabilities. But to surmise that robobosses will be so prevalent in barely over a year before we've even had these debates is quite absurd. Cognitive tools are only just emerging. While IBM has done a stellar job aligning its Watson capabilities with the healthcare industry (read our report here) and software experts such as IPSoft's Amelia and Celaton have some compelling client stories to tell, the focus on self-learning and intuitive cognitive solutions are mainly confined to customer service technology and virtual assistant chatboxes. Talk to the call center BPO providers and they're really only just figuring this out.... forget robobosses, we're still just trying to figure out some basic software to make chatboxes work better these days. Moreover, with Watson, our research shows it's best application today in the medical field is helping flesh out the bad science and saving scientists serious amounts of time doing their research. Meanwhile Celaton, in the UK, has created a really cool tool to help Virgin trains handle emailed customer queries. But the long and short, here, is that Intelligent Automation solutions today are great at augmenting processes and unstructured data pools, not replacing real people who make real decisions doing real jobs. The definition of robo bosses, and the potential value, of robobosses is missing. There is, however, something to be said for the value of increased automation combined with analytics to better understand the impact — measured by targeted business outcomes — in a more realtime way during a contract with a “gig economy” worker (or any worker). Such knowledge can help us intervene and train/coach a project “going south” sooner, or catch fraud fastest, or identify a worker to “gets it faster”. Along these lines, we see value in "robo advice", but the point also needs to be made that these "robobosses" (give me a break) do not work alone, such as with Watson and health / medical diagnosis and treatment, they work in tandem with doctors / clinicians, changing and refining the dr/clinician job (freeing up that person to be more targeted and more of a coach than a statistician) with the intent of better medical results. These robo tools (or whatever we call them) do not replace the doctor / clinician. Monitoring software has existed for decades... so when does it become a "Roboboss"? Currently, there are probably a million or more workers just in the UK (for example) managed by extreme monitoring of some kind. The Amazon style warehouse pickers, fast food cooks, many call center agents, delivery drivers, assembly line factory workers are subject to time monitoring and computers giving them tasks. We're just not sure when this turns into a roboboss? It today's swirl of gibbering noise around the social media presses, it's the responsibility of leading analysts, advisors and academics to be the voices of sanity and reason, when it comes to topics as critical as the future of work elimination through Intelligent Automation technology. The vendors love the hype as it gets them attention with clients, but analysts who like to take money from these vendors have a responsibility to articulate the realities of these technologies to their clients. They are great at augmenting work flows, and even aiding medical discoveries, but this is the real value - it's not about sacking people. It's about making operations function better so people can do their jobs better. The real "roboboss" is the human enterprise operator who can use smart Intelligent Automation tools to enhance the quality of their work. Net-net, industry analysts, advisors, robotics vendors, academics and service providers need to engage with clients around how all these disruptive approaches will affect talent management as well as organizational structures. Even without these apocalyptic scenarios, some job functions are likely to either disappear or be significantly diminished (as our 9% forecast reveals). Equally, we need to talk about governance of these new environments, touching upon ethical, but also practical, issues. This is not only a necessity for the broader adoption, but also offers high value opportunities. I'll probably get a few nasty messages as a result of this piece, but I sincerely hope this has the outcome of steering our industry conversation in a more realistic direction, backed up by real data and experts who prefer realistic conversation that mere headline-grabbing and panic creation. Phil, in my new book, Silicon Collar I spend a whole chapter titled "Sum of all fears" where I outline such scary projections from Oxford U, Gartner and many other academics, economists, authors and analysts and question their assumptions in each case. I then have a chapter called "Circuit Breakers to Overautomation where I show automation in several sectors over the last century - how society gradually absorbs the tech and gives employers and workers decades to adjust. The book is meant ad an antidote to all the pessimism of automation leading to jobless societies. In reverse, I show 50+ works settings where machines are "colleagues" and making workers safer, smarter, speedier. Because it is easier to spew hype than perform research, especially on a topic as generally vague, far-reaching and misunderstood (especially by those one would reach to when performing research) as robotics and cognitive process automation. The widespread perceived interchangeability among many, including most of the "mainstream" media , of software and physical robots is a simple case in point. Slightly more complicated is the likelihood of certain tasks within a given job being automated but the job itself remaining with a different and enhanced focus as compared to the totality of the job being automated and eliminated, at least for human staff. But back to spewing, a good spew-filled headline gets more attention than would most good market research with a set of pragmatic findings. Vintage Fersht! Bank to your best, I see. @Stan - can I give you an award for this? "a good spew-filled headline gets more attention than would most good market research with a set of pragmatic findings"
Phil, even scarier is that Oxford report which was then parroted around by 400+ other reports and articles. No timeline for job losses so could be 50 years out, and no job gains from any of the automation, as if robots will self manufacture and machine learning will be self coded. I am sure I am among many people who applaud you for calling out some of these crazy predictions. Why firms as respected as Gartner are opting for perpetuating this kind of hype is worrying indeed. What is happening to our "trusted sources" these days? I could just maybe almost buy the premise that 3MM WORKERS might be replaced by 2018 by automation - I guess we've seen something like that happen before on a smaller scale, but BOSSES? Did I sleep through some major breakthrough in AI last night? Can anybody name one example of one robotic supervisor over ANYBODY threatening to grow exponentially? Wait - do you think Garner has been watching the Terminator flicks lately? This could be the rise of the machines. Like others I agree with your view that Gartner and others are quite off the mark. Kudos for exposing them. The scare of robots, indeed of all machines, is as old as technology. Technology is disruptive by essence, but on the whole, with the benefit of several centuries of perspective, it has yet to destroy the world, and probably won’t anytime soon. Quite the contrary in fact. Over here in Singapore, qualifier labour is hard to find, and expensive. By necessity, there are stringent restrictions on immigration, and the government instead encourages automation, technology and research. This is true in all industries, in manufacturing but also in services. Automation in all shades of grey will be welcome to address the issue of an ageing population. Businesses could do more if their existing workforce could be deployed for more value-add tasks. There probably will be few job losses, merely temporary retraining and adjustment friction. Amusingly, in order to post this comment, I had to tick a Captcha Box, stating that I was not a robot, which I found quite hilarious in the context. Anyone truly investing in research in Robotics and Analytics will probably realize that the gap between hype and reality is widening. I read your article this morning and I was smiling all the way through. It’s not often I find myself nodding (and smiling) quite so much but you nailed it! Don't worry about nasty messages, the truth always comes out in the end! Is this a "skynet taking over human race" kinda prediction or the upcoming doomsday ? Utter b*s! We are in a stage where OCR gives 55 to 70% practical accuracy and ICR works nearly 45%. AI, Patterns are merely evolving and has long way to go. Why is there Doomsday hype like this to create panic and unrest among masses? I can see smart analytics being used in callcenters to support physical supervisors in managerial tasks and decision-making (performance review, monitoring, compensation). The roboboss label suggest the human supervisor being taken out of the equation completely. (Think HAL 9000 flashing on screen). Ain't gonna happen anytime soon. Perhaps the prediction was made by a robot in Gartner? Kudos to you, Phil. It's about time someone really called out the hype mongerers. While Gartner is not the only one at fault here, they should be held to a higher account as the leading "analyst" for IT. Whatever happened to pragmatic, realistic research and advice? Are those days over? Phil - back to your best, I see! Leave alone robot being bosses, automation has not yet touch the realm of mundane tasks in a backfire environment! Only yesterday, I was talking to an individual who works in the back-office of a very well known and reputed international BPO processing payments against the invoices received. She confirmed that the mundane tasks of checking if the invoices were submitted by the vendor on time are still manual, we are talking about hundreds of invoices each day, how is that for a start? Brilliant piece. I guess in today's Trump era it's all about making big statements with no real facts just to get attention of the masses? Another excellent blog, this is something I've joked about (and managed to get some laughs!) in some recent speaker sessions. A book I read recently discussed how easy experts have had things in the past when making predictions, if they get it right, they're the first to recirculate their prediction, and when they get it wrong, they enjoy the benefits of the wider community forgetting their prediction when the deadline arrives. The lack of accountability means experts don’t need to rely on data and are instead incentivised to formulate some bizarre albeit headline catching predictions. It's really good to see an old prediction being pulled from the archives and questioned and is hopefully something we'll see more of in the future. Enjoyed the read, Phil! It's time we started thinking more about reskilling and redeployment of talent than dwelling on unsubstantiated 'extreme predictions' of gloom and doom. This trend is not possible at all in 3 years time.. some absolutely wrong judgement and research..
@Ollie - I hope you're correct and we go back to a time when people needed real facts and data before making big statements. Sadly, the world of 140 character soundbites, and snippets of information is moving everything in the wrong direction (see earlier). Great post and Phil's bold approach and the questions to these large projections does make sense. May be mankind is not yet ready for the feared robobosses. 1) Raising the issue of "how far" robotics is going to go in terms of job replacement with meaningful data, real examples and balanced views. I love your comment about Robobosses being smart humans who manage automation tools well! 2) Outing these unprofessional practices of "recognized experts" making up stats to get attention. Phil, a bit mystified here? I thought Gartner is the source of the "Hype Curve"? One thing you cited, dispels these predictions right off the bat. I have lived through them, the slow rate at which organizations change! I do believe that if it were not for this, organizations could automate far faster and comprehensively than they are, alas, it is the nature of the Beast! Reading a revised classic currently that gives the reason for this in a nutshell, "The 80/20 Principal" by Richard Koch. Manager love to create complexity, because it is stimulating and to deal with it, guess what, requires a lot of management! 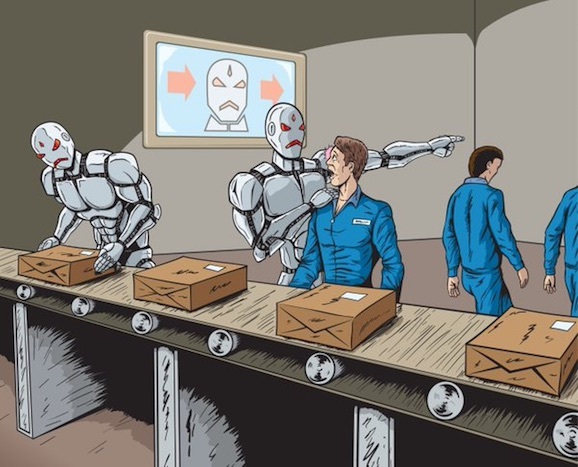 Thanks Phil - your blog further articulated the false hype created on the impact of automation, we must stop seeing automation as a people firing weapon. It's a perfect catch 22 situation where CXOs are challenged whether to adopt automation and adapt to smarter ways of service delivery OR just manage to run automation like any transformation initiative and demonstrate ROI by some people reduction calculations. At the end, real value of automation is in the books only. In all this, our job leading automation initiatives becomes more challenging since change resistance goes to peak due to false perception on automation. Without intentional leadership, Automation is a firing weapon and that is the problem. It takes a strategic vision from the C-Suite and some real guts to take the Bull by the Horns, and cut through the managerial bull; probably firing a handful of real resisters to get the ball rolling! Of course this rarely happens (reason why so few Good to Great Enterprises), so a crisis precipitates and that's when Automation becomes a firing weapon. However, do not blame the Automation, the blame lies squarely with Leadership and with what they make, this is criminal! Ask, what would Jack Welsh do? He would give you two years to hit your metrics and show you the door if you didn't and he prevented bureaucracies from taking hold in the first place, by only allowing number 1 and 2 performance. More about all of this in my next article! If you assume there will be employee or job displacement at a time when there are fragile economies then what does that say about the basic economic principles? My guess is that everyone with an interest here knows the advanced economies are broken but they can't see a replacement that does not involve some monetary based option along the continuum the world has followed for the last 100 or so years. Goldman Sach's predicted Crude oil price will touch 200 USD . it touched 26 USD this year. Again they said 2016 target is 37 USD -- Crude now is around 50 USD ..